The enterprise zone concept transcends health, and typically refers to a specific geographic area that has been designated by a governmental authority to incentivize business within the enterprise zone through various types of financial aid, such as tax credits. Health Enterprise Zones (HEZs) have been implemented in various forms and geographies, such as Maryland’s formalization of HEZs to address health disparities in its population. These HEZs join health outcome expectations with the business objectives of the typical enterprise zone, expanding the value proposition to include jobs, economic development, and better health within the zones. Philadelphia has a decades-long history with the enterprise/empowerment/impact zone concept to focus investment toward combatting poverty in depressed areas. In 2016, a partnership among lead ing public and private entities was announced to implement a North Philadelphia HEZ across 15 zip codes in North Philadelphia to impact economic and health circumstances, plus other social needs like education. The HEZ concept is a great framework to rally diverse stakeholders around a macro goal. The HEZ is also a great venue to apply digital health technology since recent growth in the health information technology space has given rise to many companies, both mature and young, that have developed innovations to address factors that would be involved in solving the HEZ problem areas. The initial focus of the DHIP is to leverage the HEZ structure as a vehicle to harness the power of digital health to improve the lives of challenged Philadelphia populations. The geographic focus of a HEZ ensures that any technologies introduced can be deployed, trained, managed, and supported in a reasonable and contained way. 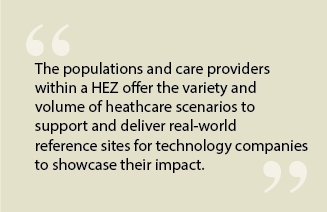 The populations and care providers within a HEZ reciprocally offer the variety and volume of healthcare scenarios to support and deliver real- world reference sites for technology companies to showcase their impact. Best of all, through the HEZ activities—and bolstered by concerted infusion of digital health technologies—the people of the most depressed zip codes in our region will enjoy a surge of the best healthcare has to offer. This will lift them from being underserved populations to being on the very vanguard of healthcare delivery, and a part of shaping the way community-based healthcare is practiced in this country. The DHIP seeks to promote and proliferate the HEZ model across the city, with HEZs eventually established in the depressed parts of North Philadelphia, South Philadelphia, West Philadelphia, and Kensington. The mechanism used to apply technology consistently to achieve better health outcomes will be the community-based care model of population health management.